Product prices and availability are accurate as of 2019-04-11 12:52:09 EDT and are subject to change. Any price and availability information displayed on http://www.amazon.com/ at the time of purchase will apply to the purchase of this product. 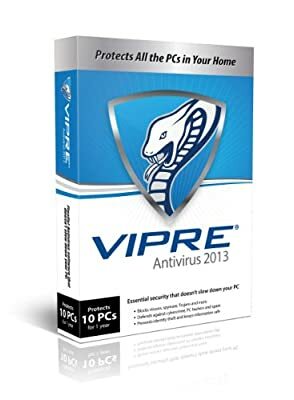 Vipre Antivirus 2013 and Vipre Internet Security 2013 protect your computer from over 100,000 New web threats every day– viruses, spyware, Trojans, adware, worms, rootkits and all other malicious software – without slowing down your PC. Vipre is easy to install and use, providing fast and memory efficient protection against malware threats with minimal notifications. Vipre keeps you safe with top-rated prevention against a multitude of threats, saving you the headache, time and expense of cleaning an infected PC. All subscriptions include threat definition updates, software upgrades, free tech support, a free subscription to Vipre Security News (optional) and a 100% money-back guarantee within 30 days of purchase.